Here are concise yet in-depth explanations on efficiently coding SAP ABAP programs. Information here has been distilled from several classes and hundreds of pages covering IDE and other tools, program types, contexts, persistence, trace, and other difficult topics. The R/3 kernel (system runtime environment) itself is written in standard C or C++. But application programs running inside R/3 are written using SAP's proprietary programming language ABAP (pronouced as ahhh-bap). Note: the "/4" in "ABAP/4" has been dropped over the confusion that the "4" referred to "R/4", which doesn't exist. Netweaver AS (Application Server) combines which SAP calls two "personalities" because WebDynpro (pronouced "web din pro") for ABAP and WebDynpro for Java use the same meta model. WebDynpro components, views, models, and controllers have the same semantics in both ABAP and Java. The main difference is the design-time environment, the development infrastructure, and the run-time environment. Components are reusable (nestable) units of the application project. Components appear as nodes within the object list on the left side of the Workbench window. Source code - instructions written by ABAP programmers that are interpreted by the SAP ABAP language intrepreter. Variants - input values that can change but are not frequently used. Attributes - properties of each ABAP program, such as its program type , title, creation and last modified date, and active status. Documentation - helps other programmers understand the program flow. Text elements - short descriptions such as report column headings. Some headings can be replaced with the longer text. Within SAP, objects are small programs related to screen design, menu design, and other functions. Dialog programs and their components are created and edited from menu Workbench &GT; Edit object (Shift+F5) Program. reports (interactive and traditional) which displays selection screens (for users to provide filtering criteria) and output (report) screens. SUBMIT AND RETURN (CALL TRANSACTION) started by entering the program name or using a transaction code; can have its own screens. LEAVE TO TRANSACTION; Can be called using tcode or menu. Have their own dialog screens. S = Interface Definition Subroutine pools PROGRAM non executable container programs for sub-routines called externally cannot have its own screens. F = Function Group FUNCTION-POOL non executable container for function modules. can have its own screens. K = Class Definition (container programs for global classes) CLASS-POOL non executable container for classes. cannot have its own screens. J = Interface Definition (container programs for global interfaces) CLASS-POOL TABLES non executable container for interfaces. cannot have its own screens. T = Type Groups TYPE-POOL non executable container for type definitions. cannot have its own screens. When an ABAP module is first created, it is stored as an inactive local object in a $TMP temporary transport. With ABAP, deployment of components are organized as Transport definitions. Objects need to be activated for editing. To invoke the Screen Painter tool, use tcode SE51 or from the Object Navigator tool. Goto Layout (placement) of screen elements (text label, input/output edit fields, text boxes, push buttons, radio buttons, etc.). Goto Secondary window to set Attributes for each field screen element in the Element List (Dict. data type (such as numbers only), format, length, etc..
TOP where globals are defined. ABAP is a declarative language with a syntax similar to the COBOL language, but enhanced for use to specify both classic procedural and object-oriented processing. ends with a period character (instead of the semicolon used in C and Java). An ABAP statement can span several lines (without continuation characters as needed in VB programs). Asterisks (*) in front of a line are recognized as comments and not processed. single-quote (') characters encase a text string, which can contain spaces. The ABAP editor converts (marks) all text to UPPER CASE unless it's within single quotes. Statements with have an identical first part can be concatenated if there is a colon (:) after that first part and individual statements are separated with commas and a period (.) is placed after the last part. Object-oriented ABAP coding follow these conventions. hide h1. stores in a hide area the value of variable h1 from the current line of the current internal table. The SAP R/3 Style Guide maintained by the SAP Design Guild provides standards for accessible user interaction design of functions, UI elements (Screens, application and task menus, Fields, Checkboxes, Radio Buttons, Drop-Down List Boxes, Lists, Tables, Trees), hot keys, and presentation of dialogues and texts. String processing in German is Zeichenkettenverarbeitung. Object assignment MOVE variable1 TO variable2 assigns values to data objects to a variable. It works like the equal sign (=). WRITE TO passes values to variables (mainly to fill character fields). database access SELECT * INTO TABLE tableB FROM dbTableA. Programming Logic contrasts ABAP with other programing languages' conditional (IF/ELSE/LOOP) statements. ULINE requests a line break in the output. 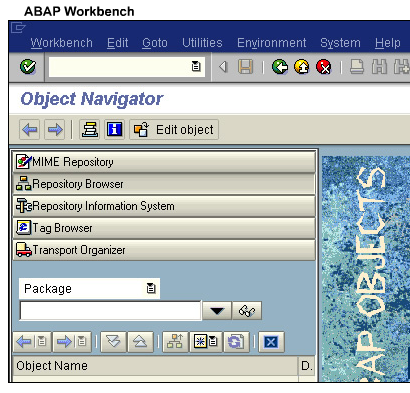 The Workbench stores its assets (such as MIME definitions and ABAP development objects (packages, programs, functions) in a persistent Repository. ABAP Workbench is the IDE SAP supplies to edit, compile, and run ABAP programs. An ABAP program defines and maniulates data using statements of specific syntax. XML-based info objects can only be edited in the Knowledge Workbench. Each field in the DD is based on a built-in DD data type or a Data Element (which in turn is based on a Domain). The Data Element contains the more semantical information (text and documentation). Data type, length, number of decimals -- essential for dealing with fields correctly and building nice user interfaces that are aware of the field attributes. Check table -- a separate table such as country name associated with a country code. Fixed values -- information about codes stored in the Domain (not in a separate table). Conversion exit -- in SAPGUI to translate between internal and external representations of data, because most BAPIs return and expect the internal format, which makes little to no sense to users. Texts and documentation: SAP stores multiple texts per field and also extended documentation in many cases. This documentation is available in all installed languages and therefore an easy way to provide multi-lingual capabilities in applications. Mixed case support. Indicates to the users which fields are uppercase only. Many text fields in SAP are uppercase only. A SAPscript form is a template that supplies the layout (for example, page size) and content (for example, sales data for an invoice) for business forms. SAPscript print program is needed to print, distribute, or display business forms. A form is made up of pages, which contains several windows (header, address, main, etc.). Text elements are formatted with paragraph formats (which define font and tab positions) and character formats (such as bold). Create a view for the component. This calls the Layout tab and creates the root element in the UI Element Hierarchy. See the view in the browser by embedding it actively in a WebDynpro window. Activate "Accessibility Checks Active" by clicking on the checkbox. Present user interface (title bar, menu bar, standard & application toolbars, function keys). Present screen elements (iViews push bottons, radio buttons, checkboxes, input fields, scroll fields). Obtain user input in fields, mouse movements, etc. Classic ABAP programs are made up of self-contained sections (containing block of code) which cannot be nested. Events in ABAP report programs are executed in a predefined sequence. START-OF-SELECTION. where select statements retrieve data. Bolded events are only for ABAP report programs. Even though code sections can be specified in any order, it's better to keep this sequence. Code for an event ends when the next event name is specified. The STOP command causes (at runtime) a jump to the next section. data i(8) type n value 0.
data final type c value 'literal'. Data are stored in data objects: modifiable field strings, variables and internal tables or non-modifiable literals and constants. Interactive report programs provide menus for user interaction. When the user clicks on a row within a basic list created using a select statement within the start-of-selection section, code under section at line-selection. is invoked to create a secondary list. When the user selects a row and clicks the Enter key, code under section at user-command. is invoked. get cursor Field f Value v. retrieves the field name and value of where the user has placed his cursor. ABAP report programs obtains results from database queries from temporary internal tables on WebAS server memory. data : begin of  tableA  occurs  100  with header line. field 1 (c) (like  databasefield1 ). field 2 (c) (like  databasefield2 ). data : begin of  tableB  like tableA occurs  100.
loop at  tableA  from 50 to 100.
" code to display data on the screen. To avoid unnecessary system load from repeating calculations, define contexts in the Context Builder within ABAP Workbench. Application programs work with instances of a context. SUPPLY input values for key fields and DEMAND derived data. Each context has a cross-transaction buffer on the application server. When you query an instance for values, the context program searches first of all for a data record containing the corresponding key fields in the appropriate buffer. If one exists, the data is copied to the instance. If one does not exist, the context program derives the data from the key field values supplied and writes the resulting data record to the buffer. CLASS &LT;subclass> DEFINITION INHERITING FROM &LT;superclass>. The largest ABAP datatype holds 65,535 characters. The standard Web user interface is WebDynpro. Business Server Pages (BSP) provides a high degree of adjustment for Web interface. SAP's Documentation for SAP Getting Started with Netweaver 2004s, 2004, and 6.30. Modeling 1. Provide business logic APIs. 2. Structure development projects in packages. 3. Create (reusable) WebDynpro components. Developing 6. Create and implement controllers and define contexts. 7. Design of views, define layouts and bind to contexts. 9. Execute testing and debugging. Configuring 10. Provide component configurations. 11. Combine WebDynpro components with WebDynpro application configurations. 13. Include WebDynpro applications to Portal iViews and roles. Adapting 14. Adapt configuration settings. 15. Enhance or modify WebDynpro components. 16. Internationalization of WebDynpro ABAP components. 17. Execute end-user and load testing. 18. Configure and personalize WebDynpro application in the Portal. Upgrading 19. Merge new developments into productive applications. Access to the R/3 System database is made using OPEN SQL statements in the PUT_&LT;TABLE&GT; subroutines. Data is passed to the executable program using interface work areas defined using the TABLES statement. Once the data has been read in the logical database program, the executable program (report) can process the data in the GET event blocks. This technique separates data reading and data processing. ABAP programmers do not need to open and close database connections since every ABAP program automatically receives an open connection to the central database in the system. ABAP Objects contain Open SQL, SAP's platform-independent SQL dialect as a direct component of the language. Accesses to data in the database are synchronized by the runtime system's lock mechanism which prevents two parallel transactions from being able to change the same data in the database. The logic in SAP's Update System avoids database rollback. To avoid keeping the database waiting, SAP maintains its own LUW (logical units of work) that spans several screens and several database LUW. eCATT (extended Computer Aided Test Tool - BC-TWB-TST-ECA) was available since release 6.20 and superceded CATT as of Web Application Server Release 6.40. SAP supplies it free as part of the R/3 system to document manual user dialog steps and to record, edit, and execute automated functional test cases without user dialog. eCATT can be used with the Test Workbench. Transactions executed through eCATT require the same authorizations as manual operation by a live person, so eCATT can be used to verify user profiles. In principle, the entire ABAP instruction set is available for use within inline ABAP code (CREATE, CALL, DATA, SUBMIT, etc.). eCATT stores its data in R/3 databases and can be controlled by Test Workbench, the Object Navigator (SE80), or externally through the BC-eCATT interface. Test modules can refer to spreadsheets providing various data that are updated in CATT Maintenance mode. Logs are created while test modules run. However, eCATT is less suited for testing lists and display results, menu paths, online help (F1, F4), free-form editor functions, and transactions that contain the statement LEAVE TO TRANSACTION. To avoid tracing the buffer load process, execute the functional sequence before beginning trace. Perform functional actions while SAP captures measurements into a file it creates. Overview shows the gross and net execution times of a program call in microseconds. hit list displays the individual components of each call. Hit list displays the execution time in microseconds for each statement executed by the program or transaction, sorted in decreasing order of the gross times. Tables hit list lists database tables accessed by the transaction or program. Group hit list displays ABAP trace results grouped by modularization unit. Call hierarchy displays statements in chronological order of execution. After each BAPI call, check the message that came back to see whether the BAPI call was successful. All BAPIs are supposed to use a RETURN parameter instead of throwing ABAP exceptions. However, different BAPIs use different structures with different field names for the RETURN parameter. Be smart about the amount of data retrieved from the database. Specify SQL to retrieve the least amount of data from the database, such as requesting only enough data to fit on a page presented to the user. This reduces memory and network bandwidth consumption. However, it may be more efficient to make one call is the user's task is make a decision (not just to refine the search). One important technique is to save the values each user provided for previous searches (such as the user's own department number, etc.) and present them to the user automatically. ABAP Function Modules can only be called from an external client if they are marked as RFC-enabled. BAPIs are RFMs that follow additional rules (as defined in the SAP BAPI Programming Guide) and are defined as object type methods in SAP's Business Object Repository (BOR). RFMs are also used to define ABAP exceptions -- a string such as "NOT_FOUND" with an associated language-dependent message text. Transaction codes BAPI and SE37 provide metadata for the several thousand SAP R/3 BAPIs and other RFMs (RFC-enabled Function Modules) in its Interface Repository. Some of them are in "unreleased" (unsupported) state. SAP only guarantees released BAPIs to be upward-compatible When SAP wants to change a BAPI in a way that would be incompatible with the existing version, they create a new BAPI and mark the old name obsolete. Find suitable BAPIs using the BAPI Explorer (transaction BAPI), then review the metadata of the RFM in the Function Builder (transaction code SE37). Import and export parameters can be simple (scalar) fields or structures (an ordered set of fields) based on Data Dictionary (DD) definitions. Tables have one or more columns (fields) in zero or more rows. Import and table parameters can have mandatory or optional attributes, export parameters are always optional. However, a easier request/response programming model is used when BAPIs are made object-oriented as methods within proxy classes representing business object types in the BOR. IDoc (intermediate document) provide a standard data container structure for SAP to exchange data between processes, such as asynchronous EDI (electronic data interchange) between application programs written for SAP or between an SAP application and an external program. IDocs is the vehicle for data transfer in SAP's Application Link Enabling (ALE) layer. Different types of IDoc are used for purchase orders or invoices. In other words, an IDoc encapsulates data so that it can be exchanged between different systems without conversion from one format to another. Each IDoc generated exists as a self-contained text file that can then be transmitted to a receiver (requesting workstation) without connecting to the central database. There are several types of IDoc records: a single Control Record, one or many Data Records, and one or many Status record. Segments and attributes of segments (maximum number, hierarchical sequence, segment status, etc.) are used for interpretating the SDATA field in the data record. Each IDoc consists of several segments and a unique number assigned each iDoc for tracking and future reference. Each segment contain several fields. IDoc data is then converted by SAP's EDI subsystem to a universal EDI standard such as UN/EDIFACT (Electronic Data Interchange for Administration, Commerce, and Trade) or ANSI/X12. Business Application Programming Interface (BAPI) is used for synchronous communication method sRFC because data usually is returned to the sending system. BAPI methods are stored as RFC-capable function modules in the ABAP Workbench Function Builder accessing the SAP Business Object Repository (BOR). Here are my comments on the topic area class SAP offers to prepare people for the their "SAP NetWeaver 2004 - Development Consultant � Application Development Focus ABAP"
The curriculum on the right column is my design for students taking a more task-based, exploratory approach to learning, in a context of a team jointly developing complex systems. The result is that learners can become quickly productive in a complex environment. For example, rather than starting with a simple "Hello World", learners work with real code because one of the skills required of professionals is the ability to ignore the clutter and work under ambiguity.